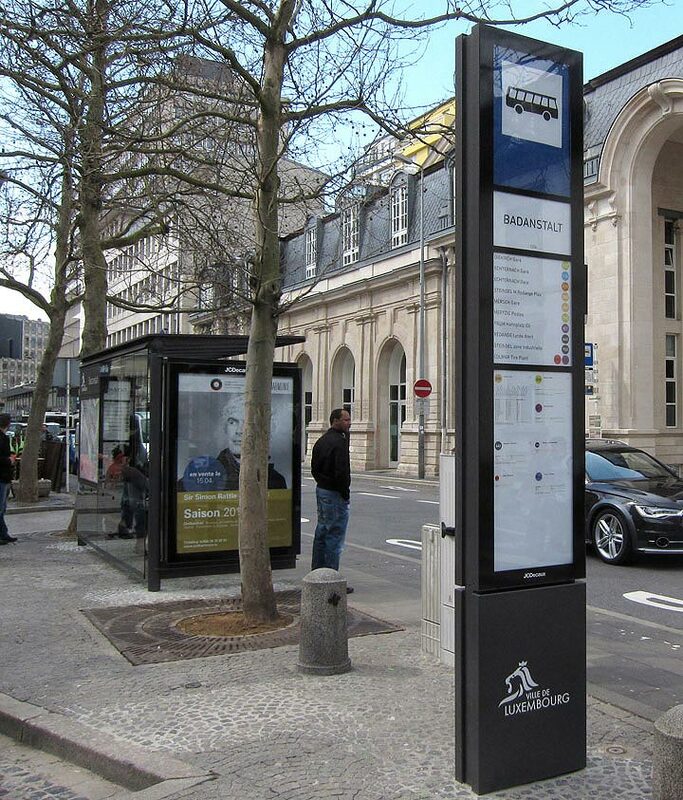 Further to my recent design & customisation project of the new bus shelter for the city of Luxembourg I have been asked to develop a graphic charta & system to integrate the city wide bus network into the existing Luxembourg city map. The political aim was to make the complex bus network more user-friendly and comprehensive for visitors that are not familiar with the network, thereby encouraging the use of public transport. 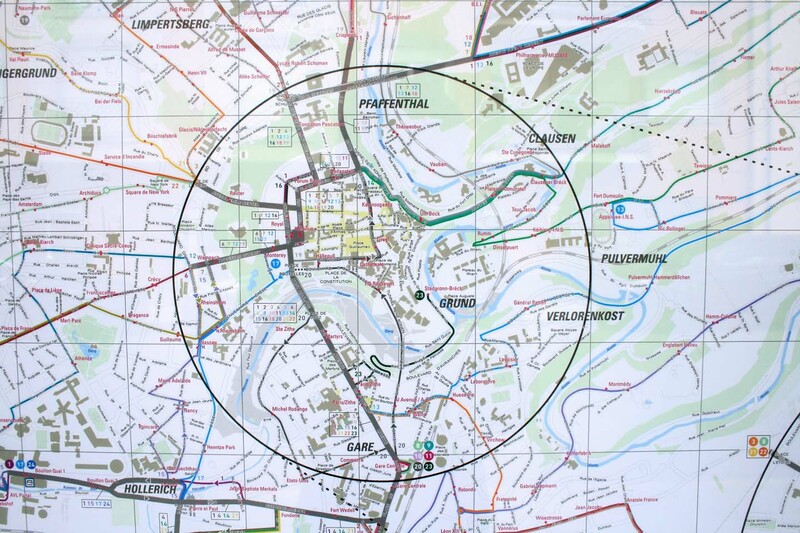 Together with the AVL (Luxembourg-city bus services) & graphic design company Monopolka we have developed a graphic charta with very constraint rules & guidelines to make both network and city map work well together. As a base the city wanted to use a topographically accurate map (based on the local ordnance survey type map) as its used by all internal services and is updated automatically when changes are made anywhere within the city. 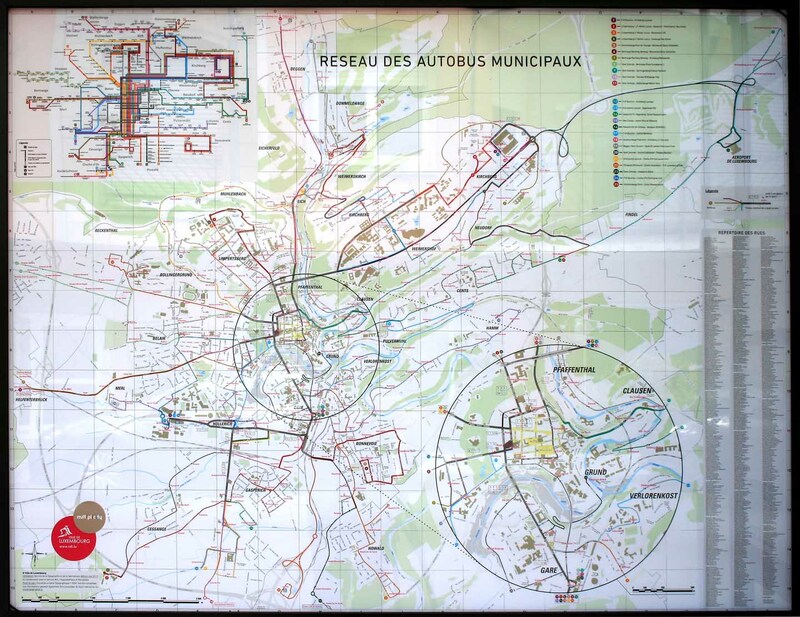 Based on that system and with our graphic manual they are free to update their public transport map internally, without relying on external contractors and without disabling rights-of-use for the map. Last but not least, unfortunately we didn’t have the opportunity to re-design the bus network diagram on the top left corner of the first image below. Something that has been of much debate in recent weeks in Luxembourg… But hey, it’s never too late. Designed for outdoor spaces like nature reserves, parks & forests, this seating range is composed of large & chunky shapes with very simple profiles. 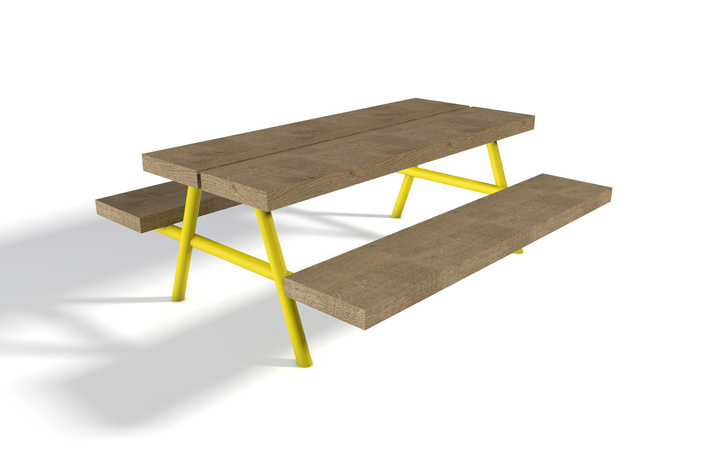 The large – single piece – wood parts are made from locally sourced oak trunks with a simply sawn finish to resist weathering and vandalism. Due to its thickness, the wood can be sanded down if damaged but can also happily live with the added texture. The wood profiles and tubular powder coated steel tubes are both an integral part of the structure and form objects with a strong visual contrast between natural and man made materials. The simple & sculptural shapes should integrate well in natural environments, yet stand out enough to be noticed for its quality. Based on an existing JCD shelter designed by Norman Foster we fine-tuned & adapted the design in collaboration with the city and JCD to better fit todays user needs. Over 250 shelters will be installed / replaced the next couple of years across the city’s bus network. With a user-centered approach the team developed a new back-lit independent totem that regroups a number of information that is easy to read, even from a distance. The same logic applies to the glass panel on the opposite side where we also re-grouped passenger information usually spread randomly all over the shelter. Last but not least, in close collaboration with the city’s own topographical service and the graphic design agency Monopolka, we have designed a new map of the city with the entire bus network overlapping in a clear, geographically accurate and user-friendly design. More on this soon! 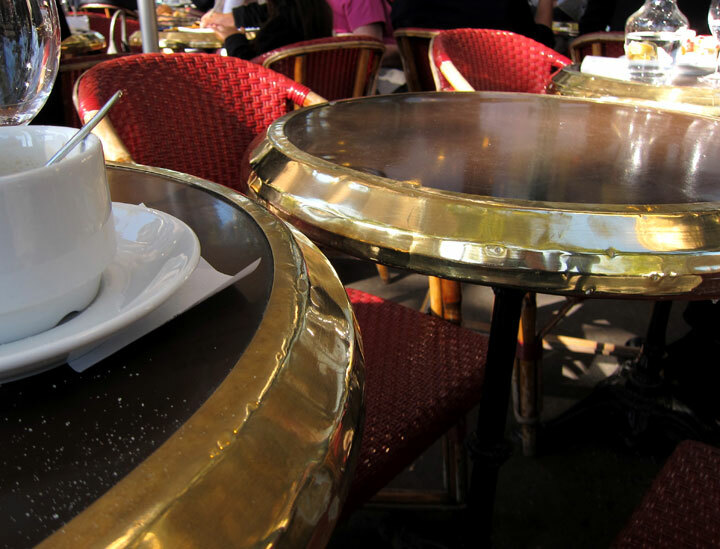 The typical Paris bistro table with a single foot and an oversized thin metal edging embodies this way of life quite well for me. Every bash and knock the metal edging gets adds character & texture to the table, making it age gracefully without aspiring to be perfect. 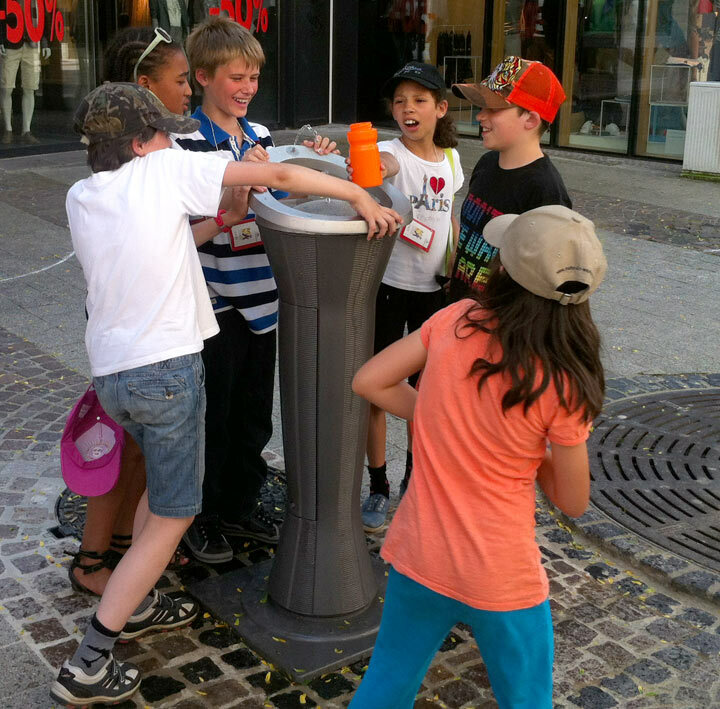 This water drinking fountain is the first of many to be installed in the City of Luxembourg. 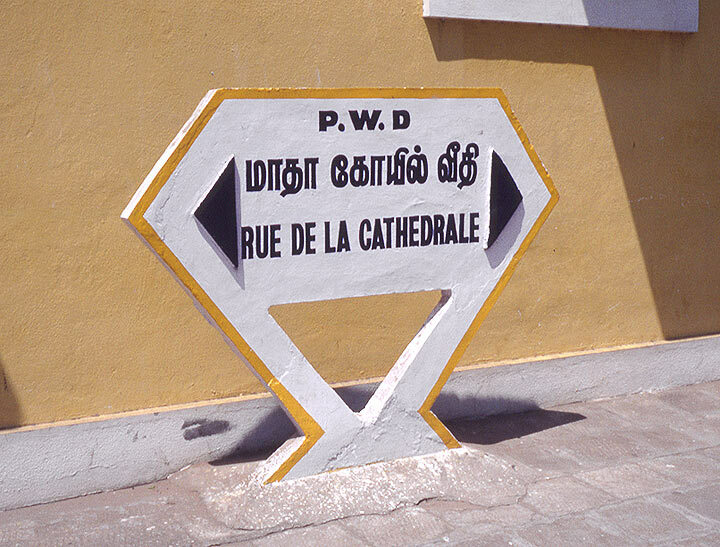 The scheme was initiated by the city’s own Service des Eaux and elaborated in close collaboration with the City Management, other administrations of the city and myself as an external design consultant. After an in-depth research of existing drinking fountains across Europe we have identified this fountain as the most suitable product for Luxembourg. The fountain has initially been developed by the french designer Cécile Planchais for Eau de Paris and will also be rolled-out in Paris next year. 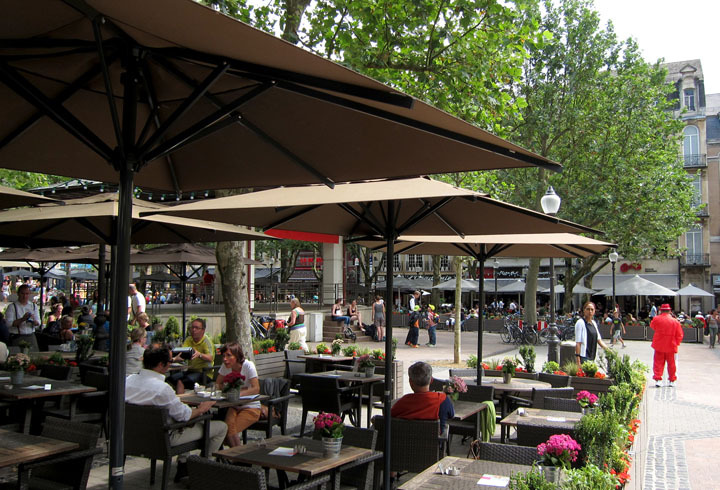 Besides the functional & hygienic qualities its subtle timeless design has convinced us to be the right choice for Luxembourg. The textured surface and distinctive shape blurs the boundaries of time, making it contemporary but also fit nicely in an heritage environment. Also, after two days in use in the city the form and shape has proven that its function and purpose is self-explanatory. 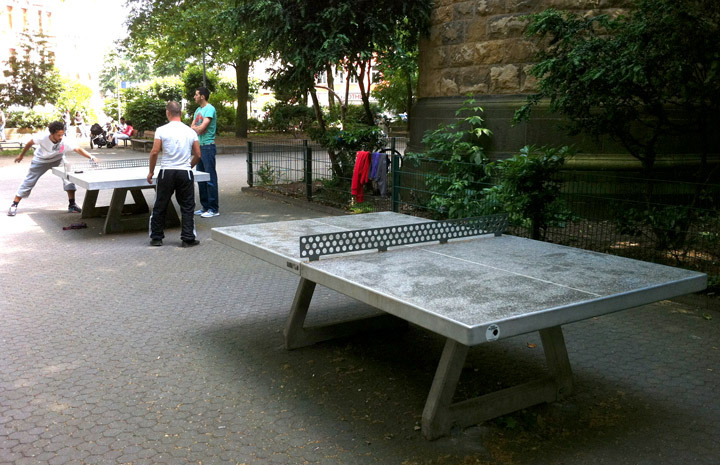 Street furniture doesn’t need to be limited to the basic amenities such as seating, lighting ..etc. If you want to induce live into a square, this is a good way to do it, and it keeps you fit too! 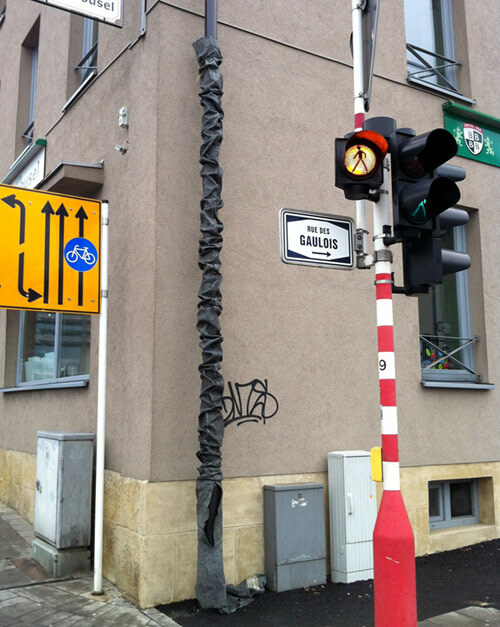 A piece of streetfurniture, still partially wrapped after installation. Textured surfaces could be really nice in the public space! 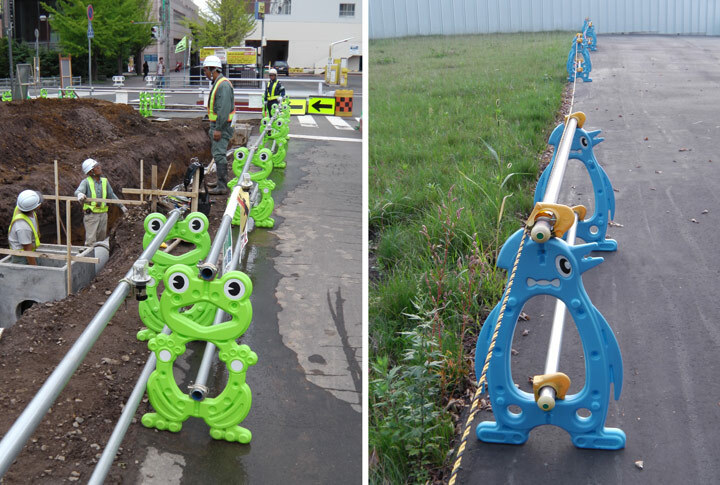 Road works barriers are rarely a pretty site in Europe, but if you live in Japan it is a whole different story. To the delight of the Japanese kids there seems to be an endless variation of cartoon animals that populate the roadside. Not sure it makes much more sense in terms of safety / visibility ..etc, but I guess fun is a good enough reason and you can’t really spoil a construction site with visual clutter either. I have seen this type of benches before in forests and parks without really appreciating them. 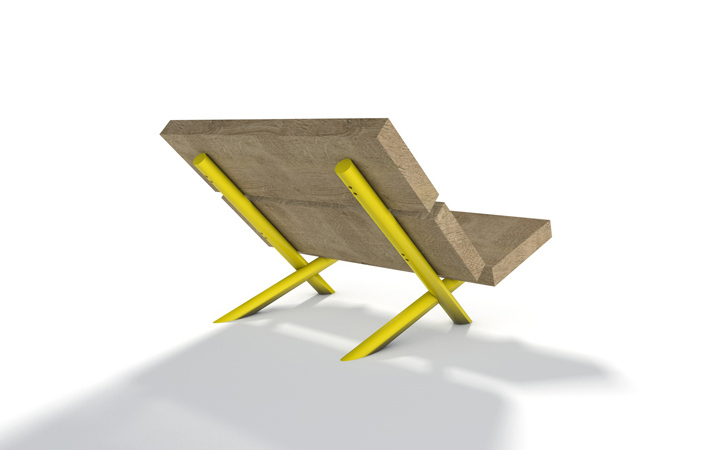 But the concept of a bench with a cast structure that mimics root wood, as disturbing as it looks, starts to grow on me. If you choose casting as a technique you can also open up to other shape typologies, no reason to keep the geometric language you pretty much have to respect if you fabricate something in any other standard way. 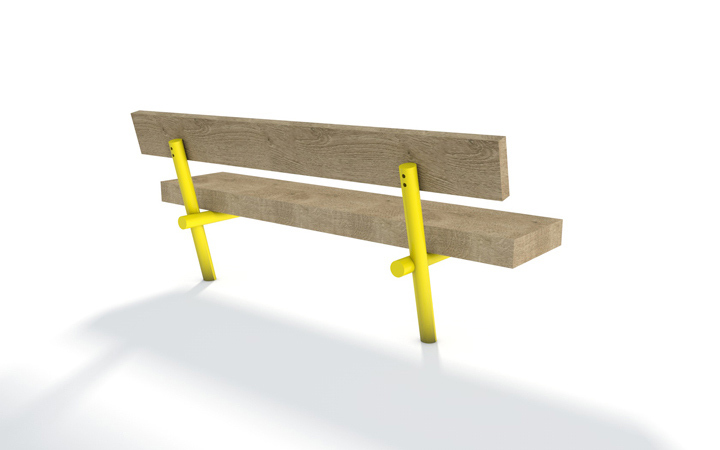 To then paint it in such a colour makes the bench almost eccentric, even if it goes against the initial idea of making the bench blend into its natural surroundings. Each day our cities seem to get more cluttered with new types of street furniture and equipment that didn’t exist only a few years ago. These new elements include endless amounts of operational electrical and telecommunication boxes that sprung up as these providers have been privatised and now operate without coordination. 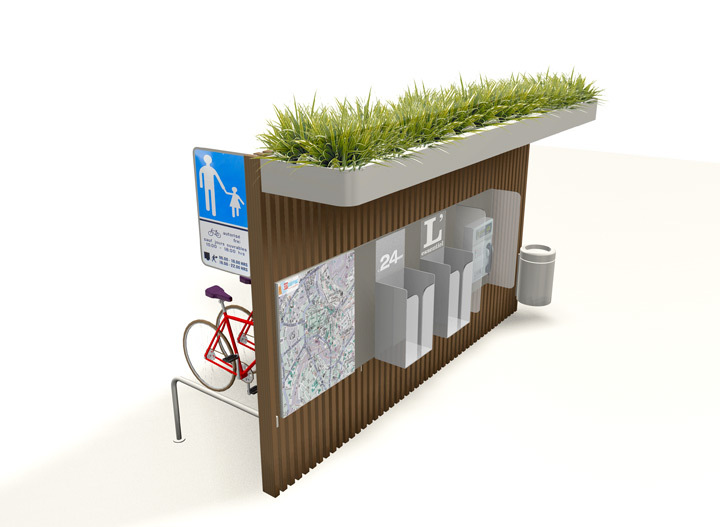 Additionally we also see an increase in free magazines dispensers, wi-fi masts, bike hire schemes, advertising and signage …etc that are implemented by different operators. Finally, the first digital advertising screens for city centers are threatening to be creeping-up in a city near you. 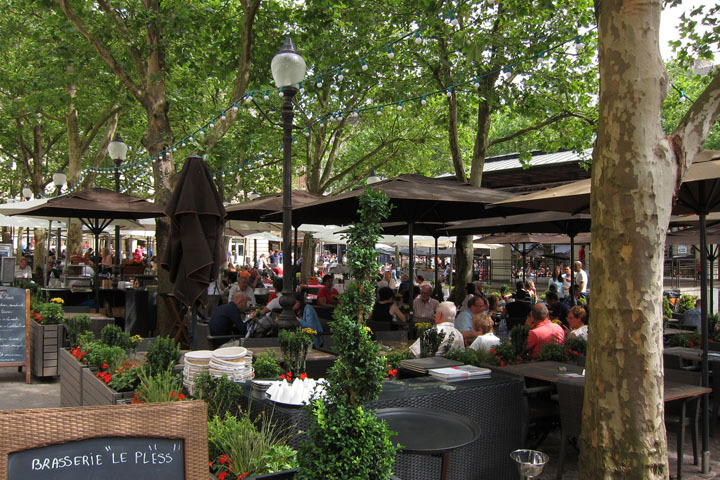 This creates a messy cocktail of visual pollution that damages the perception of our cities and we think it is important that cities have an organised and coordinated approach of how to handle the visual implications to our shared public space. The level of clutter should be contained and kept to the required minimum but, as many amenities remain necessary, there is also scope to regroup these into clusters and find new solutions of how they can be brought together or integrated into existing elements. We have produced some first thoughts on this topic based on a specific urban context but to find a holistic approach requires an in depth consultation between all stakeholders (city officials, road engineers, private companies, urban planners and designers) to work out a strategy that is easy to apply to different urban situations without costing over the odds. In some situations this would result in new designs but the overall aim should be to regroup existing elements or to find inventive solutions that don’t require new structures. 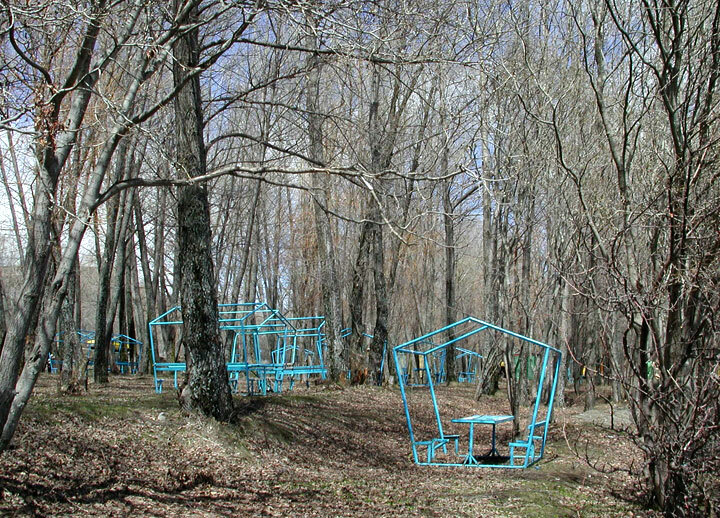 A friend of mine sent me this amazing picture of a picnic area in the woods near lake Sevan in Armenia. The first reflex of a local authority would be to paint these structures in a camouflage green / grey to blend in. I find this choice of colour stunning and beautiful, the contrast of the cyan blue in the wood highlights both nature and man-made structures, producing a surreal fairytale ambiance.